Co-Written by Yevgen Grishenko of Gameloft, and Adam Telfer of Mobile Free to Play. Puzzle as a category has been dominated by the Saga progression system for over 6 years now. When we think of the puzzle category, we think of King’s Candy Crush Saga, Playrix’s Gardenscapes, or Peak’s Toy Blast. Each use the same progression system: create thousands of levels for players to play through, and offer them boosters to go faster along the map. But if you look at the puzzle category as a whole, there’s actually one major game we’re forgetting: Disney Tsum Tsum. This game breaks the norm by not focusing on a single lane map, but rather a high score challenge. From the west’s perspective, this is an outdated puzzle game system. The Puzzle category used to be dominated by timer-based games (Bejeweled Blitz and Diamond Dash) but Candy Crush wiped them out in 2012. How can a timer-based game compete with saga games? LINE Disney Tsum Tsum is a game that hit the benchmark of generating 1 billion dollars in revenue back in July 2017 (source). It’s outperforming Homescapes, Gardenscapes, and Toy Blast. It is behind only Candy Crush within the category. It’s hard to argue with that kind of success. So how did they do this with a simple high score game? It’s easy to point to the power of the Disney brand. Collecting disney characters from your favourite franchises is definitely appealing. However, the success of this game goes far beyond just the license. On top of being a disney game, the game focuses a lot on gacha mechanics. Something that many puzzle category games have struggled to add, yet we know from other genres is a strongly monetizing system. Yet, the graph shows a clear insight: more than 95% of the game’s revenue comes from Japan. Part of this is because the “Tsum Tsum” toys that this game is based on actually are only sold in Japan. Where Japan can rely on the marketing of the physical products, the rest of world has no idea what these little things are. Yet do not dismiss this game as a Japan-only phenomenon. This game is the master class in live operations for any casual game, and one that a product manager ignores at their own peril. This game, despite it’s simple core, has the blueprints for any mobile game to create a compelling event, sales, time restricted content, and reward schedule. Let’s dive in to what drove Tsum Tsum’s success. What is Disney Tsum Tsum? Disney Tsum Tsum, at its core, is just a simple line drawing game focused around reaching a high score. The core gameplay asks you to touch and drag lines to connect characters (called “tsum tsum”s) . The longer the line, the higher the score. This is very similar to Jelly Splash, Puzzle Craft, Jewelanche, or Royale Boulevard Saga. Similar to Royale Boulevard, it also has an aspect of physics. As seen in the image above, pieces don’t just slide into pre-placed grid positions like in most match 3 games. Instead, pieces fall and rotate according to physics. It feels more like a container of marbles than it does a rigid Bejeweled board. As such, pieces dropping from the top feel natural, and removing blocks from the board have a nice organic feeling to it. Pieces fall and bump into each other creating new matches. Unlike in all of the modern top Western puzzle games, Disney Tsum Tsum has a timer, more similar to Bejeweled Blitz or Diamond Dash. Players goal is thus to rack up the needed score in under 60 seconds to pass a level. However, in addition, the timer can be extended by popping up Magical Bubbles or by spending some Hard Currency. In other words, the game sells more time just like a traditional puzzle game sells more moves. Matching Tsums also increases the Fever Meter, which when activated gives a bonus to score for a short period of time. Finally, a player can always use a Shuffle, which mixes all the Tsum Tsums and creates new possibilities. This all sounds simple right? So what’s the big deal about a line drawing game with time? Disney Tsum Tsum’s success is all about what is wrapped around this core. Which characters come into the match, and why the high score matters to you. Wait… what’s a ‘Tsum Tsum’? Before we get too into the weeds on what the metagame is, it’s important to acknowledge the power of the brand, especially in Japan. “Tsum Tsum” is actually a range of Japanese collectible stuffed toys. They are similar to “Beanie Babies” in the west. Fans collect Tsum Tsums from shops, and collectors strive to complete the collections for various major Disney brands. 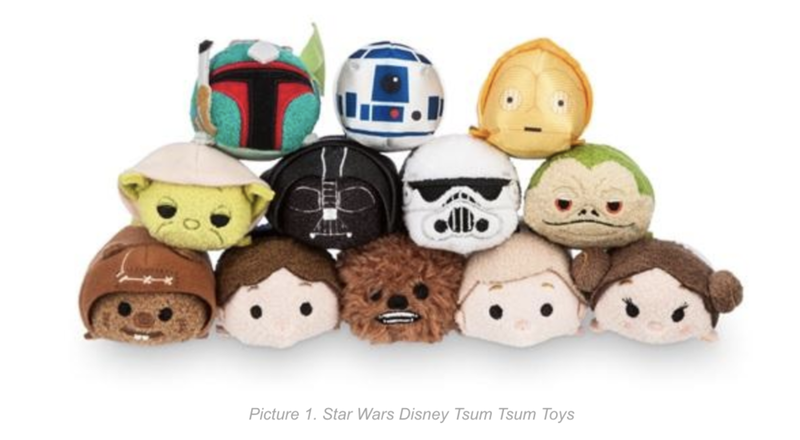 Disney Tsum Tsums feature brands such as Star Wars, Marvel, Disney, and Pixar. There’s plenty of memorable characters to collect. Following real world release of the toys, LINE corporation released a mobile game in Japan in 2013 and a worldwide version in 2014. Each actually features different sets of available Tsums and Live Operations (events). Each time a player enters a round, they decide which Tsum Tsums to bring in. They have 8 slots to fill, and this impacts what characters are dropped from the top. Each Tsum has a level and a skill. Increasing level will mean this tsum generates more score. Increasing skill will improve the impact when the tsum’s special ability is triggered. Each time a player uses a Tsum, they earn experience for it to increase level. Skills can only be upgraded with rare “Skill Tickets” or by getting a duplicate in the gacha. This is far rarer, mainly because the skill upgrade is far more impactful to the core gameplay and harder for the designers to scale infinitely (there’s a limited amount of upgrades that actually make sense). Blasters (1), when activated, clear some area of the screen. It may be a specific shape (T-shape), or a straight line (horizontal, vertical, diagonal), or just blast a bunch of random pieces. Hearts (2) turn some amount of Tsums into other types that may be connected afterwards. For example, Princess Aurora turns many other Tsums into a Prince Phillip, which can be connected together to build even longer lines. These two types of skills are shared by a majority of Tsums. However, some are unique and rare – Sulley, when activated, enlarges several Sulley Tsums into big Tsums. Scrump chooses an random skill, just for fun! So with the core game just being about score, why would I pick anyone besides my most upgraded? Why would I want more than one blaster? more than one heart? That comes down to the missions. Missions, which are the predominant source of rewards, put pressure on a player to have a wide collection of characters. Some missions are far easier with specific tsums, some can only be won only with specific Tsums. For example, in the above, the task of “clear 3 big tsums in 1 go” is far easier when you have tsums like Sulley. You’ll need a tsum that can generate the big pieces. So to complete missions as quickly as possible, you’ll need a wide collection of the 200 different tsums. Some have overlapping abilities, while other missions are more specific. To drive collection further, all Tsums also belong to a thematic collection. For example, the Evil Queen belongs to the “Snow White” collection, Sulley belongs to the “Monsters, Inc.” one and so on. Pacing of the game is very similar to most casual games – playing each round costs a heart, which are regenerated over time. These modes are all that’s necessary to keep the variety in the core gameplay as well as give compelling goals to the player. Soft currency (SC), which is generated while playing in all modes, is spent in a variety of ways, including upgrading Tsums and purchasing regular gacha packs which contain new characters or duplicates of your current ones. Special Tickets can only be earned from Bingo and Events. These include resource booster tickets, skill level tickets for upgrading the special skills of tsums, or tickets to open the Premium Gacha. These are far more rare and more valuable, driving players who really want to progress to focus on these modes. Events are built to drive monetization: exclusive rewards to drive desirability, unique gameplay to drive variety, and clear time pressure. Each month has its unique theme. For example, August 2018 was dedicated to Winnie the Pooh character and had a related event (1). Each event consists of several small chapters (2) with each of them in turn requiring several missions to be won (3). After the all chapters are being cleared, a user receives the final reward (4), usually a new or featured Tsum, and unlocks the next level of difficulty with increased rewards. Each event (1) has some specifically featured Tsums that increase player`s performance in it (2). They are usually connected thematically (ex. Winnie the Pooh tsums are featured in the month of Pooh) and each may be found through opening featured time-limited Gacha boxes. Each of these featured characters drastically increases performance in the event. With score goals being so high, the bonus score generated by a featured character is something that separates winning from losing. Alongside each event, the game launches promotions to help players collect the necessary tsums (3) usually that grant bonus Hard Currency (rubies) which can be converted into SC and to be spent on Gacha. The second phase of the event sequence is launched in the middle of August, and requires specific characters to play the event. These are the same characters that were useful in the first phase. 5. Run over a month, broken up into two or three phases. These features not only drive monetization, but also increase retention – Choosing to chunk the event into 1-2 weeks duration keeps players engaged. When Events are not active, or if a player has already finished it, they may choose to play in the Bingo card mode, which is non-linear campaign mode. This functions as a grid of missions, which the player needs to complete in any order. Completing any horizontal or vertical line will give a small reward ti the player. Completing all squares gives the biggest reward: an exclusive Tsum or a Premium Gacha ticket or a Skill ticket. There are 10 cards in the game in total, each with increasing complexity. The trick is that a player decides which card is activate. Players can go for any level of bingo card they want. While this is a nice way to give additional goals to the player, and give many goals in parallel to avoid frustration, it also presents the player with a lot of choice and necessary research. Which card is the best for me? I have to search through each cell, remember my collection, and think of what cells are feasible, which cells are impossible given my current collection. That’s a lot to remember. Missions in the cards come in plenty of variety, but you can see the underlying design goals or each card. Some missions are there to drive monetization. These are typically goals which are about completing an objective in one play. This will drive players to use a Tsum of specific type, for example – a “round eared” tsum, or a one “whose name starts with P”. As you may imagine, such limitations have a very strong impact on how these goals are being reached, as not all Tsums with a “P” name well suited for reaching some of the objectives. Yet this is a creative way to drive players to have the widest collection of tsums. A player has two options in this case – use boosters or hunt for a Tsum he needs. If the first options is affordable and serves as SC sink, but not always leads to success, the second one – serves clearly to push certain content to players. Yet some goals are more for Retention. They ask a player to achieve some result over as many rounds as it takes. Meaning that sooner or later any player will reach it, the only variable here is number of plays. And lastly, there are some missions that are just… frustrating. For example, a mission to collect EXACTLY 256 coins in a play session. This may be alright for variety, but this is clearly just a frustrating mission. This mission can’t even be skipped, and there’s no way to make it easier. To collect all the tsums, the game offers three types of Gacha. The Happiness Box (1) is the “chaff” box which is always the same, with the same set of basic Tsums. It has the lowest chance of getting the best content, and is mainly used for early game play. In the very beginning of the game it contain plenty of normal characters like Mickey, Minnie, Donald, but eventually you’ll want to upgrade. Pick Up Capsule (2) is a time limited Gacha which only appears from time to time, usually with 3-4 days duration. Their appearance sometimes coincides with an event launch. They are usually promoted with some better tsums, but never exclusive event-related Tsums. What is the most interesting about this Gacha type is that it`s a finite Gacha. Each time a player takes an item from the pool, it is removed from the pool. So if a player invests enough, they can get all its content. All prices for Pick Up Capsules are always fixed (30k SC), and number of Tsums in each capsule is fixed too (15 per capsule), so a player will need to invest roughly 450k SC or around $50 to get all the possible characters that are being featured. A Premium Box (3) is used for promotion of featured and time limited content as well, but is always available in the Shop. As apart of the live operations, the content pool of this box is always changing. In one box, the Three Caballeros featured tsums have increased drop rates. This promotes players to be “shopping” constantly for the best box to purchase. That keeping players interested in the premium box rather than assuming it will always be available with the same odds to get the content you want. A fun fact: the sum of the probabilities in the box don’t always equal to 100%, so these are actually more weights than percentages. The game also notifies the player about this, most likely to avoid legal issues with Japan cracking down hard on being transparent about the odds in a loot box. The merchandising strategy for Disney Tsum Tsum starts with the basics: it’s focused around selling the premium currency in the game, rubies. For one, they can be converted into SC which can be used on the gacha or levelling up characters. In the action phase, players can purchase additional time when time is up. This price increases each time you use it in a round, eventually making it a very difficult purchase to make. This can dramatically aid players attempting to beat a difficult mission, reach a high score, or complete a bingo square. Missions can be modified to be easier, giving players a way out of a difficult mission in an event. This is most likely a strong conversion for some events for players. However in terms of western-style monetization, being able to modify missions directly may be too close to cheating. Culturally, most monetization in puzzle games never alters the goal, just allows play for boosters to make the goal easier. While making missions easier may not be the focus of their monetization (my assumption is gacha and additional time would be used more), this starts to show the cultural differences between making a game for the west versus for japan. Can Tsum Tsum move West? In closing, I’d like to try to answer the key question that I brought up in the introduction. Can Tsum Tsum be as strong in the west as it is in Japan? Currently Japan is 95% of its revenue, can this change? Overall the bones of the game are strong. They have a compelling fun core gameplay that anyone can pick up and play. My instinct is that the puzzle marketplace has been frozen in the Saga progression system for so long that it’s inevitable that a game that goes away from moves and goes towards time (shifting back towards Bejewelled Blitz and Diamond Dash from 2010-2011) is inevitable. On top of having a core loop which is more focused on events has already been proven to be working with puzzle audiences with games like Toon Blast. The game centers it’s progress too much around the gacha. This is fine in Japan where it’s broadly appealing to use gachapon machines. People of all ages and gender are comfortable with the machines and enjoy using them. Yet the west has become less and less entranced by Gacha style mechanics. Western audiences want progress that feels more transparent and clear. Secondly, the game demands too much choice and offers too many goals in parallel to the player. The metagame feels more like a RPG game than it does a casual puzzle game. 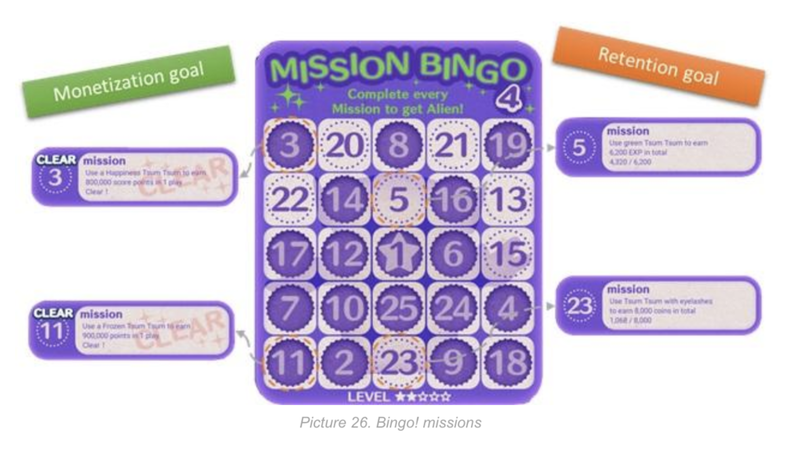 Bingo cards offer a double-digit amount of missions that the player needs to complete at any time, and try to be very subtle about what it takes to complete them. While this reinforces the gacha, it also becomes mind-numbingly difficult to keep track of your missions. My recommendation would be to take a page from Jetpack Joyride’s book and limit the number of missions available in parallel. Overall we shouldn’t let this detract from the success of this game. This game is a masterclass in how to manager your live operations and keep a game fresh for over 4 years. I look at this game and see a game that needs to bend so far in order to make the gacha economy work, that I fail to see how a similar economy could work in the west. Simplifying the economy further will only put less strain on the gacha system, making it even harder to make money. Buy moving away from the Saga system, you take away the clear goal system that the saga system provides and what the casual puzzle audience requires. However I can’t help but feel a bit inspired by this game and how it operates. Could a developer shake up the puzzle space by creating a success that has no Saga? Whether it’s LINE & Disney who figures out how to drive innovation in this space, or another developer, only time will tell. Sep 5 Battlelands Royale: Contender Or Pretender?